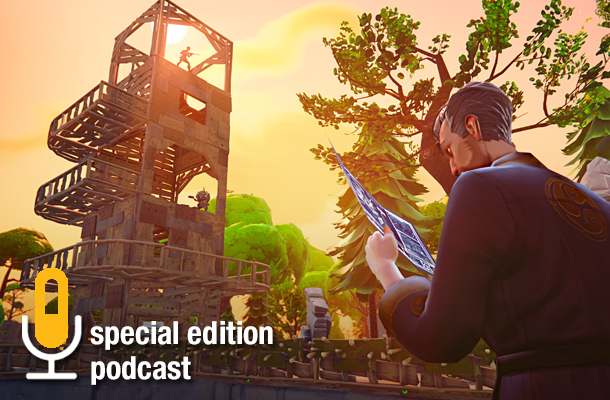 We're closing out our month of Fortnite coverage with a long Q&A featuring Epic Games' Wes Phillips and Fornite lead designer Darren Sugg. The two were kind enough to travel out to our office in Minneapolis to answer questions from the Game Informer community. [Excerpt] Listen to the episode below (or subscribe on iTunes) to learn more about the game's design and the possibility of it being released on consoles. To learn more about Fortnite, check out our full month of exclusive coverage by clicking on the banner below. Want to play Fortnite for yourself? Sign up at Epic's site for a chance to be included in the upcoming alpha.